Activity restriction is important for dogs undergoing heartworm (Dirofilaria immitis) treatment. However, it is not usually needed for the entire process, just during the time after Immiticide (and, the newer medication, Diroban) injections are administered. Willie gets his Revolution heartworm preventive/flea control EVERY month on time without fail. Patients undergoing “slow kill” heartworm treatment need activity restriction only if there are complications or preexisting heart disease. Follow the advice of your veterinarian. When Immiticide begins to cause adult heartworms to die, the healthy way for them to be disposed of is for white blood cells (WBCs) to munch away at them like little Pac Men. We want microscopic pieces of the heartworms to be disposed of. During vigorous activity, blood flow through the heart is increased. 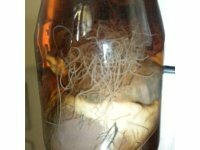 That increase in “washing action” over the dying adult heartworms can cause large pieces of decomposing heartworm bodies to be freed into circulation. If an artery becomes occluded by this floating log, embolism occurs. Embolism is defined as “the sudden blocking of an artery by a clot or foreign material which has been brought to the site of lodgement by the blood current.” Embolism is a noun form, as is embolus, which refers to the actual object blocking the artery. The plural form of embolus is emboli. An embolus can clog an artery in the heart, brain, kidneys, lungs or other vital organ. If that happens, tissue death usually occurs because the obstructed artery can no longer supply oxygen and nutrients to the tissue. Adult Dirofilaria usually reside in the right ventricle of the heart and the pulmonary arteries that convey “used” blood from the right side of the heart to the lungs for releasing waste products and picking up new oxygen. Therefore, the lungs are the organ most likely to suffer embolism. In the best-case scenario a pulmonary embolus is small and a minor area of inflammation occurs. The next-worse possibility is a larger embolus that results in a small area of tissue death and low-grade pneumonia. This picture is usually accompanied by a cough and requires attention by your veterinarian. Even larger emboli can cause death of an entire lobe of the lung, requiring thoracic surgery to remove the damaged lobe. Sometimes the inflammatory reaction is so great and so sudden that fluid pours into the lungs and the patient dies within minutes. None of this is meant to scare you, however we cannot overemphasize the importance of restricting activity during this phase of heartworm treatment. How “restricted” is “restricted activity?” Running is out of the question. As are long walks. Venturing outside the house, including to fenced-in yard, must be on a leash. One quick burst of speed chasing a squirrel or stray cat could bring on an embolic complication. For most heartworm-treatment patients the activity restriction period is only 2-3 months long. Considering that following the warning may avoid a fatal complication makes it a small price to pay. Heartworm Disease IS A Big Deal! I am having trouble finding out the degree of activity that is safe while my dog is on the initial phase of heartworm treatment with Doxycyline and Prednisilone… can we take a moderate walk of a mile as long as there is no running etc? and what about moderate play inside? My dog is keyed to activity before eating. If she does not eat all ‘breakfast” food she will generally eat after the noon walk or scarf it up after the dinner walk and sometimes eat ALL of her dinner after that. She does not currently exhibit symptoms… tho she may pant a little sooner than I would expect. I also understand that SEVERE restrictions are needed after the arsenic shots…. In order to give more advice than what is contained in this article, we would have to have a doctor-client-patient relationship. However, it should be a simple matter to ask the veterinarian who is treating your pet. Even if the doctor can’t come to the phone, one of his/her assistants should be able to get you an answer to your question, tailored to your individual pet from the doctor who knows her. 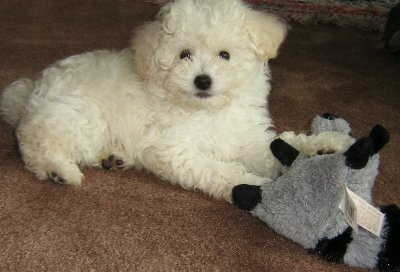 Thanks for reading MyPetsDoctor.com.